’Following the various meetings and the eye-witness reports from the drivers at the Le Mans 24 Hours test day on Sunday 4th June, the ‘South’ pit exit will be used for the race’, says the ACO’s statement this morning (June 9). That means that the long, slow exit to a point joining the track at the first left hander at the Dunlop Chicane will not be used for the race. The cars will use the pit exit that has been in place for as long as anyone can remember. The longer, northern exit was the choice of the FIA when it homologated the current track, but Henri Pescarolo led the opposition to the use of that exit, before and during the test day. “Safety is an absolute priority shared by everybody and we hope that the solution we’ve found will allow the drivers to leave the pits in the safest possible conditions,” said Daniel Poissenot, the ACO assistant general manager and Le Mans 24 Hours Clerk of the Course. The south exit will be used from the start of the first session of qualifying on June 14. With the changes to the fast right hander after the pits, the Dunlop Curve, the situation exiting the pits will be slightly different from previous years. With the large, new gravel trap on the outside, the Dunlop Curve is now closer to the pit exit. Accidents have happened here in the past, notably in 1999 when Thierry Boutsen in the Toyota GTOne was knocked off by a Porsche leaving the pits. But with a degree of caution, the south exit should be safer than the one used at the test day. 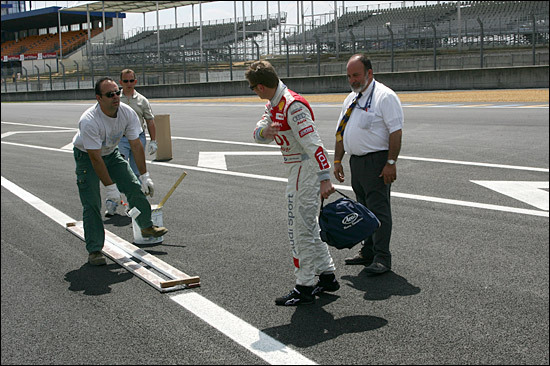 Here's Allan McNish last Saturday, as the lines are painted to guide the cars up the pit exit lane used on June 4.